On April 9th, the SheTech was held in Salt Lake, Utah. 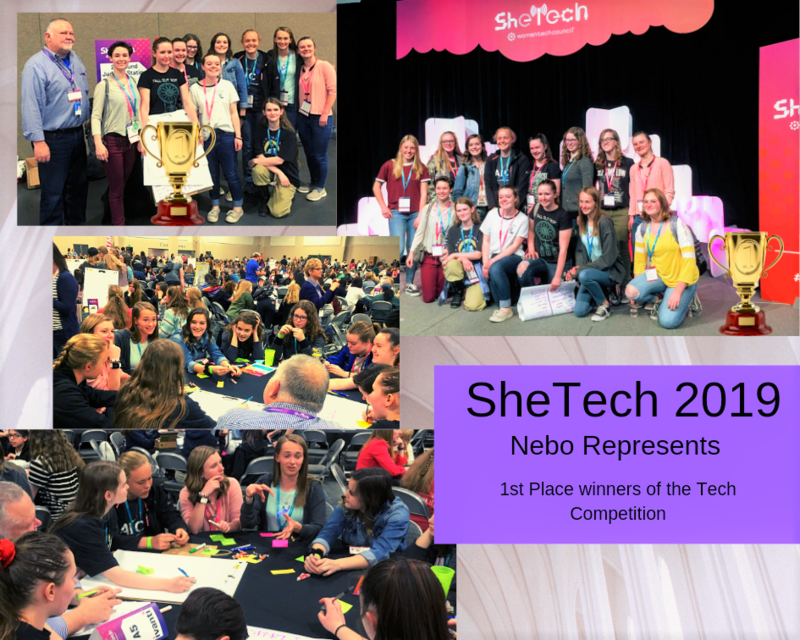 Women Tech Council’s SheTech program is the largest industry-led STEM program to activate, engage and inspire high school girls into STEM degrees and successful careers with over 12,000 participants. The masses of girls in attendance were broken up into groups/teams, and then the teams were given an allotted time to come up with a challenge, or project in that time frame. This was an "on the spot" challenge to see what these teams could come up with "spur of the moment." Teams were given a real natural disaster situation and had to come up with a way to overcome the challenges of that natural disaster. The team from Nebo School district created a design for a solar powered light that would allow survivors to found sooner as well as provide a basic need to people in the disaster. The teams’ design and presentation earned them the 1st place honors. Judges came from Technology companies from all over Utah to award the girls their 1st place honors. "Our plan to provide immediate support and relief to the people of Puerto Rico is to find people and then help people. With the use of highly durable and high tech drones, we will analyze the island and create a 3D mapping system complete with locations and possible routes. Heat sensors paired with HD zoom cameras allow remote operators to locate human life more efficiently. These drones carry light, inflatable plastic shelters that a cost-efficient and made of recycled materials. When delivered and deployed, they contain basic emergency medical supplies, radios, survival guides, and food and water filters. They can host from 5-10 people. The purpose of these is to give basic emergency support until human teams can locate the victims. In the future, we have plans to use communications or even holograms to instruct and direct life-saving care. We are also designing the drones to be solar powered, have high-frequency radio communication, and withstand water and high wind speeds. This technology has widespread applications as it can be used and implemented in any disaster from any location, whether a base or a boat. This life-saving technology isn't just for Puerto Rico; it can be used anywhere that drones can fly." CONGRATULATIONS TO THIS GROUP OF GIRLS!